Since its founding at the 1964-65 New York World’s Fair, the New York Hall of Science (NYSCI) has inspired more than 7 million people by offering creative, participatory ways to learn. One of America’s leading science and technology centers, NYSCI is known for exhibitions and programs that offer rich opportunities for exploration and social interaction. Two recent NYSCI initiatives—Connected Worlds and ACCESS: Artist and Scientist Collaborations —correlate to the United Nations’ Sustainable Development Goals on sustainability and climate change education. In June 2015, NYSCI debuted Connected Worlds, a groundbreaking exhibition on environmental sustainability that immerses visitors in a fantastical world. 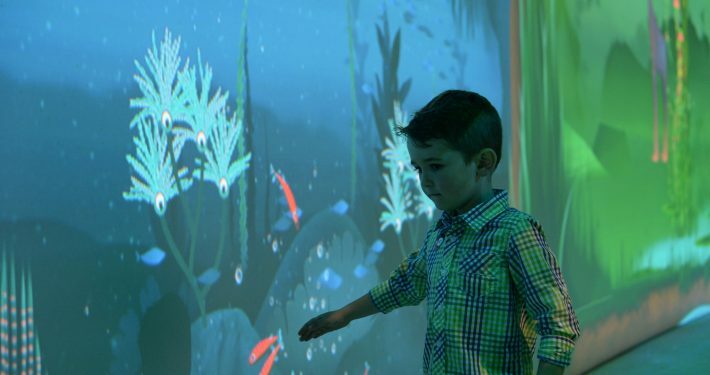 Connected Worlds features gesture-based technologies that encourage museum visitors to explore the interconnectedness of six different environments (desert, mountain valley, plains, reservoir, jungle, and wetlands). Each environment features their own unique trees, plants, and creatures, but they all share common resources, such as water and weather patterns. While interacting with the animals, plants, and trees, visitors learn about the importance of keeping systems in balance and see how our individual and collective actions can have widespread impact. The permanent exhibition is open daily to families, individuals, and groups. NYSCI’s program, ACCESS: Artist and Scientist Collaborations, attempts to address some of the challenges that are encountered when communicating climate science to the general public. Through pairings of artists and scientists, works such as artist installations, video projections, sound sculptures, workshops, and special events will create exciting new ways to educate visitors about ecology, connected systems, sustainability, and climate change. The artist-scientist teams work together over a six-month period with final works showcased at NYSCI November 18–December 31, 2016. Coche Gonzalez, a freelance TD/compositor who has worked on museum exhibitions, commercial animations, and film effects, and Jack Tseng, a paleontologist with interests in both field-based and laboratory-based research on the fossil record of carnivorous mammals. ACCESS collaborations will be documented by science reporter and producer, Flora Lichtman, who has been covering science and the environment for the last decade. Her science reporting has appeared on NPR, The New York Times, Popular Science, and The Atlantic. ACCESS and Connected Worlds are just two examples of the many programs that NYSCI offers to engage and educate people of all ages about important topics such as climate change and sustainability. With nearly 500,000 visitors every year, these programs will make a significant impact, helping to increase the public’s understanding of sustainability and climate science.